Apart from the splendours of natural beauty, Cherrapunji houses some of the monuments that add to its tourist value. The First Presbyterian Church here was established by a Welsh missionary in lower Cherrapunjee at Nongsawlia in 19th century. 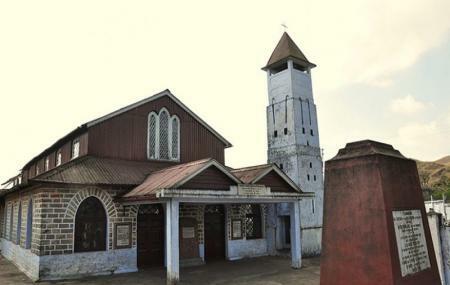 This is supposed to be the first Christian church in the north east India. Khasis the natives of Sohra got so much influenced by Welsh culture that they started dressing up like them and even the hymns sung in the churches have Welsh tune. The church looks grand due to its magnificent structure with a beautiful bell tower. Visit this monumental glory to understand the religious history of this place. Ask locals about church mass timings. How popular is First Presbyterian Church? People normally club together Mawsmai Cave and Nohsngithiang Falls while planning their visit to First Presbyterian Church.